Download a printable catalog of all our polymers. First order? Be sure to check out Discounts and Coupons. PolySciTech scientists also have years of experience working directly with customers to develop new custom polymers and products. Contact us to request synthesis of a new product. Abdellrazeq, Gaber S., Mahmoud M. Elnaggar, John P. Bannantine, David A. Schneider, Cleverson D. Souza, Julianne Hwang, Asmaa HA Mahmoud et al.. "A peptide-based vaccine for Mycobacterium avium subspecies paratuberculosis.". Vaccine (2019). 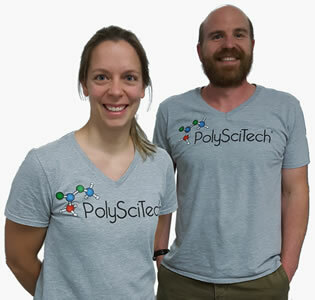 View a complete list of Published Research that used PolySciTech products. Stay up-to-date with the PolySciTech Newsletter from Akina, Inc. View past issues and subscribe. Akinalytics, a division of Akina, Inc., specializes in controlled release drug delivery systems as well as biodegradable polymers and their pharmaceutical/biomedical applications. Learn more about our Contract Research capabilities. Akinalytics also offers sample analysis with rapid turnaround and competitive pricing. Our capabilities includeFTIR Spectrophotometry, UV/Vis Spectrophotometry, GPC, Modulated Differential Scanning Calorimetry, Pheometric Analysis, Mechanical/Texture Analysis, Optical Analysis and more. Learn more about Sample Analysis with Akinalytics. PolySciTech® products have formerly carried the names Polycelle, Hytrocell, Stentrix®, PolyShield and χtopore (xtopore).